I already wrote about my love of fritters. One of the great things about them is their versatility. You can use a basic recipe and adapt it to the season. I like to play around with the said basic recipe, which sometimes leads to – ahem – failures. But this is what recipe testing is for, isn’t it? Despite some disappointments on my side (yes, I’m thinking of you, broccoli-parmesan-coconut flour MESS), fritters are the perfect – fast, cheap, versatile – way to use up leftover veggies in the back of your fridge, create something even picky eaters might like and that will make a great breakfast or lunch the next day – WIN WIN. This time I wanted to use an ingredient that is so commonly available as a frozen product, that – at least in Germany – it’s hard to find fresh, despite being an iconic spring produce: the humble pea. Podding peas isn’t a widespread activity. Well, it IS time consuming. But instead of joining an expensive Slow Movement seminar, I’m suggesting to get your friends or kids around the table and take some time to pod your peas. I was quite excited when I finally found some on the market and had a chat with the marketer: He called them healthy chips, because he uses to sit in front of the TV and is enjoying them straight from the pod – a crunchy and sweet snack. I thought this to be a great idea! Just make sure, the peas are young and fresh – only then you should enjoy them raw. 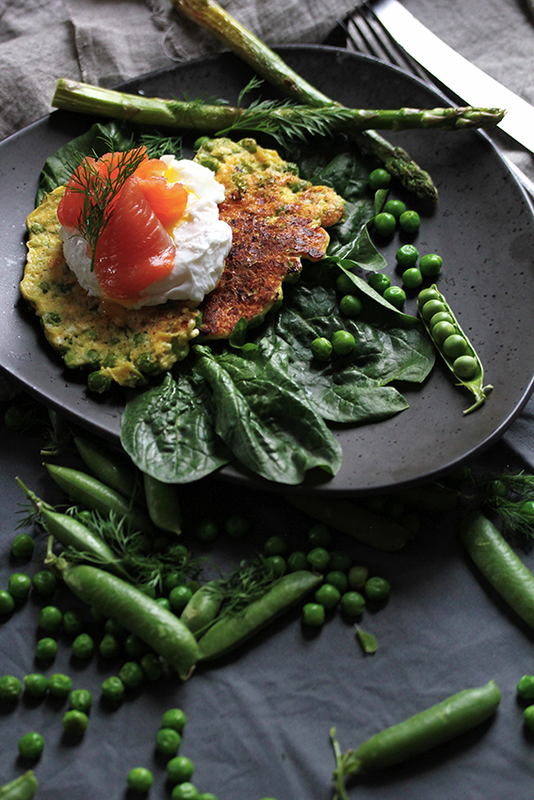 You could easily call these protein fritters. Peas are an excellent source of protein, they provide a wide range of essential and non-essential amino acids, which is why they are popular as a vegan protein powder. 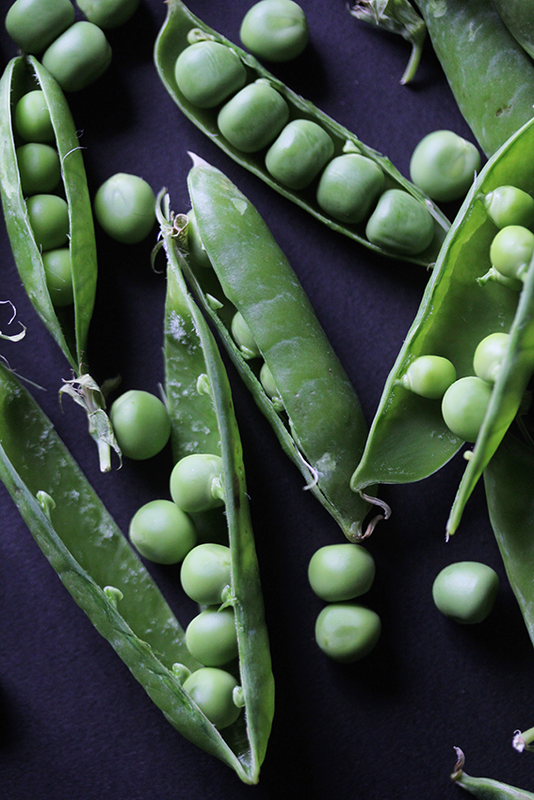 The fresh peas also contain quite a lot of iron and B vitamins. Cottage cheese has quite a reputation as a ‘diet food’, due to its low-fat and high-protein content. Traditionally it was made from the skim milk that was left over from butter making. In the fermentation process the casein-containing portion of the milk separates from the whey and the curds that are typical for cottage cheese form. I actually tried to drain the cottage cheese even further (I was afraid the fritter mixture would be too liquid) by placing it in a cheese cloth overnight and then wringing it out, but this proofed to be quite unnecessary, because the cheese already is almost completely devoid of the whey. 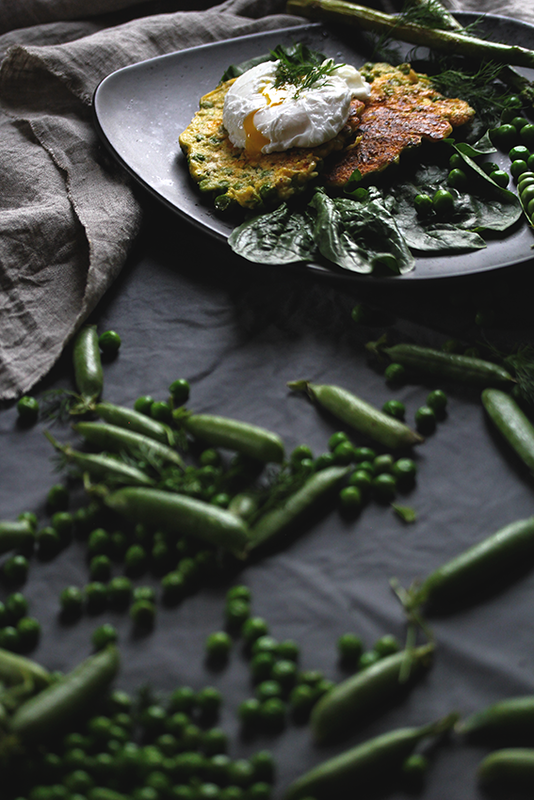 The fritters are really filling – especially if you serve them with a poached egg and the (wild-caught! Please never buy any farmed salmon, even if it’s organic!) salmon. No one was able to eat more than three. The good thing is, any leftover really will make a satisfying and long lasting breakfast or lunch box addition. If you’re using frozen peas, thaw them. If you’re using fresh ones, blanch or steam them for 1-2 minutes. You can either use a food processor or a hand held mixer for this recipe. If your using the latter, start by mashing 150g of the peas with a fork. Chop the dill and grate the horseradish and lemon zest. Place all ingredients, except for the whole peas, in a bowl (or the bowl of your food processor) and whisk together. Than incorporate the whole peas. Melt ghee or coconut oil in a pan on medium to high heat, place one tablespoon of the mixture in the pan and form a fritter. I could fit three fritters at a time into my pan. Wait until bubbles show on the upside, for about 3-5 minutes, than flip the fritters and give them an additional 2-3 minutes in the pan. Lower the heat after the first batch and add fat for the next one if needed. If you like, serve with a poached egg, greens, quickly sautéed green asparagus and some more peas.